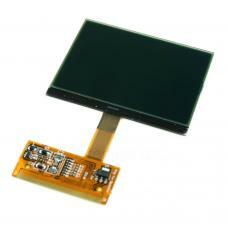 Replacement lcd screen for your Audi Jaeger cluster. This part is compatible for certain model vehicles, will fix problems with missing pixels and should be installed by an experienced professional. The part is compatible with Audi A3/S3 8L Series Jaeger (1999-2004), Audi A6 C5 4B Series Bosh and Jaeger Only (1999-2005), Audi TT 8N Series Jaeger (1999-2005).